A Czech zoo has decided to remove the horns of 18 white rhinos after a deadly attack last week at a French zoo where poachers shot a rhino and used a chainsaw to cut off its horns. Welcome to the new normal, where even zoo animals have to be mutilated to protect them from poaching. To quickly recap, poachers broke into the Thoiry Zoo near Paris on the night of March 7th, shot a four-year old white rhino named Vince twice in the head, and then used a chainsaw to cut off his horns. Brutal, right? It was the first attack of its kind in European zoo, and it’s clearly rattled zoo officials around the world. For the procedure, vets will put the rhinos under anesthesia before removing their horns with a chainsaw and filing down the sharp edges. The removal of rhino horns causes no permanent damage to their health, and the horn eventually grows back. The Dvur Kralove Zoo has never had to do this before, except for reasons like transport or health concerns. 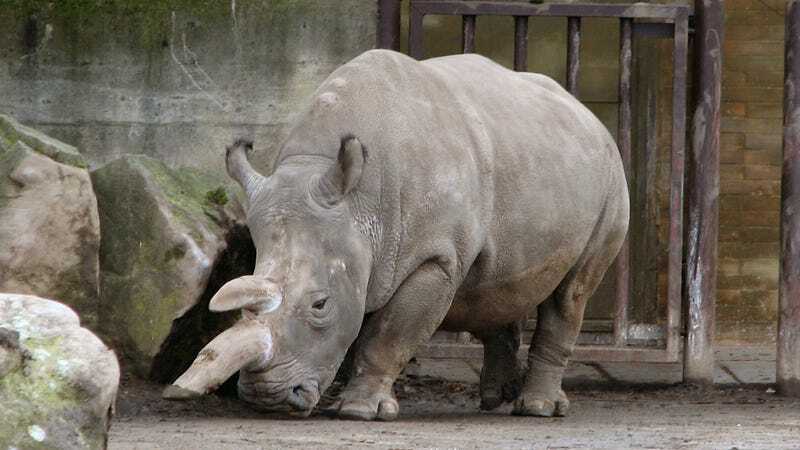 The Czech zoo is particularly sensitive to the issue, given that it’s the only facility in the world to have successfully bred the rare white rhinos while in captivity. In 2009, the zoo relocated three northern white rhinos to the Ol Pejeta reserve in Kenya. It’s difficult to know if these precautions are reasonable and a proportionate response to an emerging trend, or if the attack at the French zoo was an isolated incident, but the zoos aren’t taking any chances. Similar to the Dvur Kralove Zoo, the Pairi Daiza Zoo in Belgium is planning to shorten its rhinos’ horns as an anti-poaching measure, and to protect its security personnel as well. In the past, rhino horns have been stolen from European museums, so it’s not ridiculous to think that captive rhinos, who are kept in zoos where the security is lax, are at risk. As for the Paris attack, police investigators say they have reason to believe the attack at the Thoiry zoo was orchestrated by an organized trafficking ring. The unknown perpetrators have still not been found, and they’re in possession of a horn valued as high as $42,000. Though the sale of rhino horn is illegal, the contraband item is coveted in China and Vietnam for its alleged medicinal qualities and as an aphrodisiac. At an estimated value of $54,000 to $60,000 per kilo, rhino horn is more valuable than gold or cocaine. Wild rhinos in Africa face a similar threat, and conservationists have resorted to similar measures. Recently, dozens of rhinos at the Phinda Game Reserve in South Africa were sedated and had their horns sawed off. The northern white rhino has been decimated by poaching, and there’s fear that rhino deaths will soon overtake births. Our First Glimpse Of Chester Zoo&apos;s New Baby Black Rhino!